SABR sells and distributes Loftware Universal Connector, for Barcode Label printing and RFID encoding integration with various existing systems. The Loftware Universal Connector establishes a high-speed 'connectivity bridge' between between existing ERP, CRM, or other systems of record and the Loftware Print Server®. The combination of Loftware Universal Connector and Loftware Print Server enables applications to generate labels across large networks of printers and empowers companies to comply with current and future barcode label and RFID specifications. 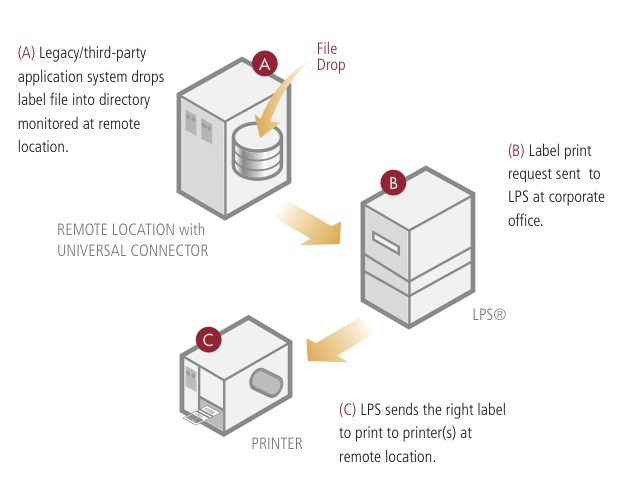 In combination with the Loftware Print Server, the Universal Connector enables you to address customer-specific requirements in labeling printing without having to deploy high-value programmers to make changes in coding. By using integrated business logic embedded in the Universal Connector and leveraging Loftware's configuration-based user interface, you can drive changes in label printing from your enterprise system and an application with which you're already familiar. The Universal Connector includes File Drop capabilities realized through sophisticated business logic applied within the Universal Connector that enable it to change label templates, look up external data and make customer specific changes to your existing processes without requiring additional coding - adding both flexibility to label printing and intelligence to the file drop process. Supports File Drop initiated label printing from any application that can gener ate XML, PAS, CSV or XLST files as well as XSL transformation of XML. Note: The Loftware Universal Connector was previously known as the Loftware Connector for Java.